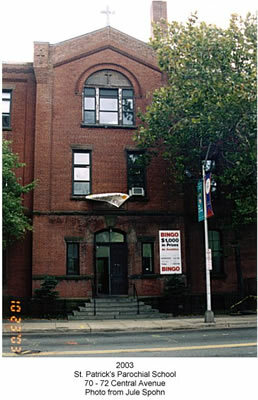 On Central Avenue, adjoining the St. Patrick's Cathedral, is located the parochial school of the cathedral. This institution is very large as well as being very popular, being under the care of the Christian Brothers. Many of the young men of Catholic parentage take great pride when they leave for promotion, or to take their place in the busy world, in saluting this school as their Alma Mater. The Sisters have charge of the primary department, where probably a greater number of children attend than any other parochial school in the city, except St. James'. St. Patrick's is the successor of St. Mary's Hall, which was formerly conducted on High Street where the women's department of St. Michael's Hospital now stands, and was founded by the venerable Father Senez, who at that time was pastor of St. Patrick's Church.